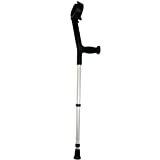 The Double Adjustable Crutch with Folding Cuff is designed to fit a fun, busy lifestyle, so it is both comfortable and adaptable. It is made with aluminium tubing and contoured plastic (PP) for the cuff and handle. It is great for individuals with mobility problems for use out and about, or around the home. Maximum user weight capacity is 120 kg. SINGLE CRUTCH — ORDER 2 TO GET A PAIR.